Treat yourself to more restorative rest every night with this Soft-Tex™ 2.5” memory foam and fiber bed mattress topper. Premium-quality memory foam topper adds comfort and therapeutic support to any mattress. Allow 1-2 weeks for delivery. 2 1/2” of ventilated Sensor-FOAM® relieves pressure. Sofloft® polyester fill keeps it shape. 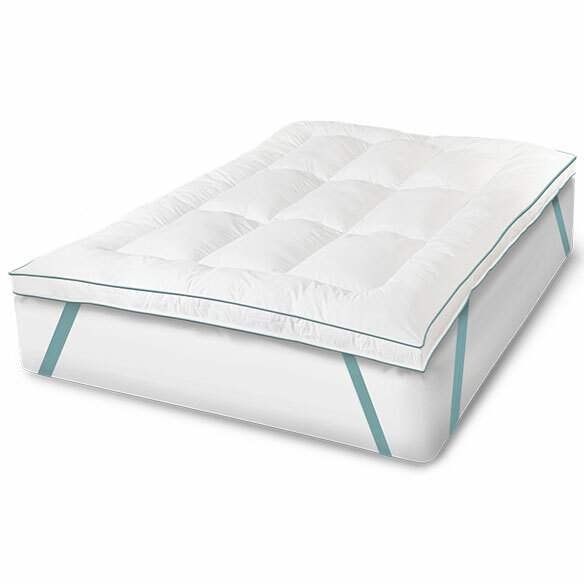 Nanotex® polyester cover is designed to keep this memory foam bed topper cool. Baffle box stitching keeps fill in place. Specify size: Twin (75” L x 39” W), Full (75” L x 54” W), Queen (80” L x 60” W) or King (80” L x 76” W). Sorry nothing good to say. Me and husband have back problem and want this to help with that. It looks very comfortable. I need it for my son's bunk bed that has a futon bottom bed that he uses and think it would be great to put on top so he won't feel the bars undernneath the mattress. Will be great for his back and sleep better! Is this non-flammable? My mother is in a nursing home and we can only buy her a mattress topper that is non-flammable. BEST ANSWER: Thank you for your question. This item does meet all flammability standards. We hope this information will be of help to you.